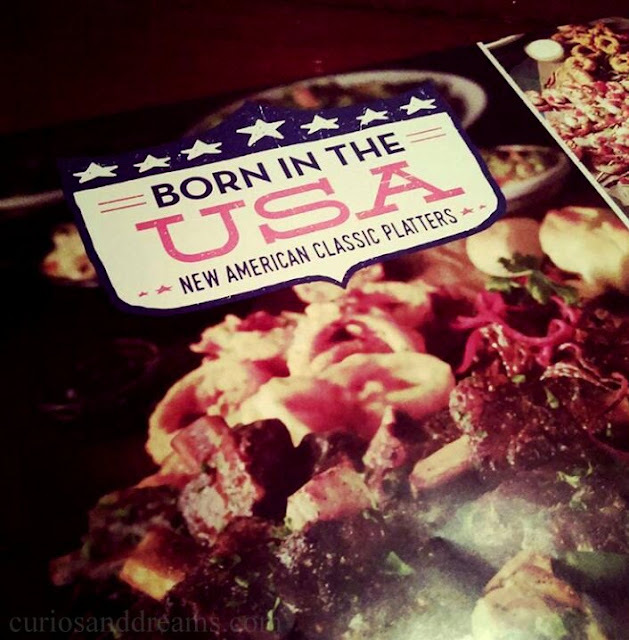 Curios and Dreams | Makeup and Beauty Product Reviews : Food For The Lover : TGI Friday's, Born In The USA Spread! 2. The employee of the month for the past month a.k.a me, your story-teller. 4. 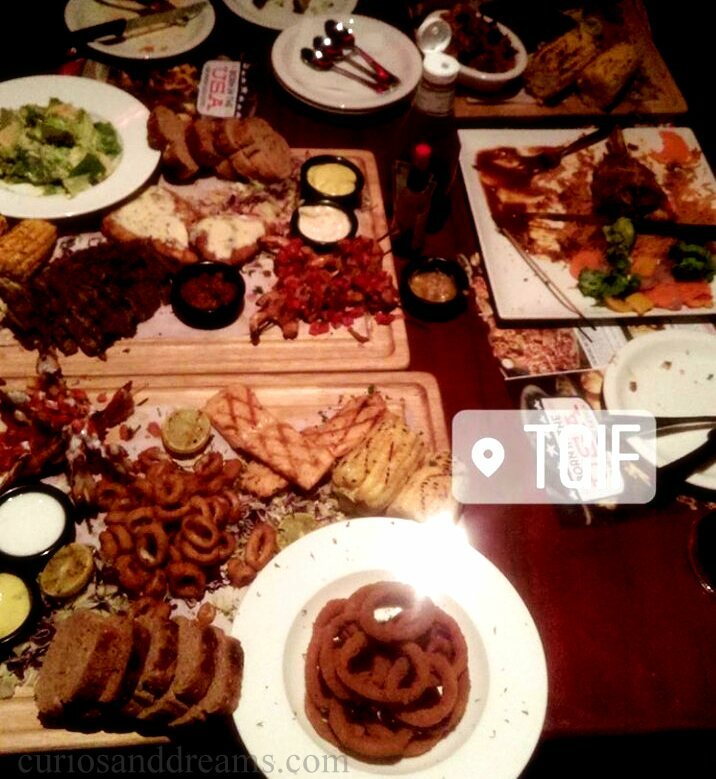 One huge table with lots of mind-blowing food. TGIF…TGIFriday Thank God (or as many would say it...Gawd) its Friday or, if you like things a bit spicy, Friyaaay, isn’t that why you’re here? So it’s my responsibility towards you my dear reader and since the name is Gyan, I shall give you some of it. Bring on the cocktails shall we!, (RamLal, fix me a bath in one of those damn lovely glasses please! Total heart eyes happening mate! ), a Long Island Iced Tea (it really was lit people, whoa!!) and a Mojito (this is my thing!, she exclaims. ), cocktails my friends, because no good story ever started with someone eating a salad. Simplicity is the ultimate form of sophistication, which lends itself to being the purest form of flattery and seduction. The last 2-3 years have opened up a Pandora’s box of upstarts. They’ve out-innovated, out-designed and out-menu-ed each other at every twist and turn for that one great prize. A pie of your tastebuds, pun intended, they’ve unleashed hitherto unknown gourmet cuisines, they’ve repackaged ghar ka khana and homely feels in ways Vikas Khanna would be proud of, and they’ve taken presentation levels worthy of being on prime time television. RamLal : Shall we get on with the Story Sir? Oh, yes, right, cracking on then. Yet these remain Upstarts, and amongst them stand tall, proud and ever strong and sure of their place a long time veteran of innovation where it matters most, and a special favourite of those who revel in the beauty, the simplicity and unadulterated joy of great food encompassing international cuisine. 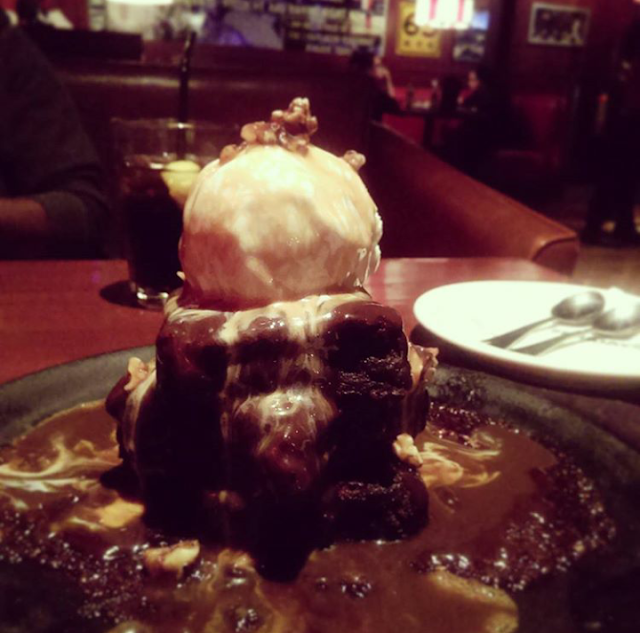 TGIFridays dons this role with class, with panache and definitely with a lot of ease. So, the establishment that introduced Long Island Iced Tea, potato rings and everyone’s favourite, onion rings to the World, brings to their menu, their Born in the USA fare, with their absolute superstar lineup of Classic Platters which have some timeless American cuisine. The BOSS Platter, which is a generous serving of Fridays classic barbeque full rack Pork Ribs (oh these are absolutely fantastic! she exclaims, these come from Spain you know, I tell her! ), Fajita Tenderloin steak slices and blackened Chimichurri Chicken (this and the chimichurri dip served with this one, has to be the revelation for me), served along with corn cob (hey take a boomerang of me eating this very awesome corn, No, she says), garlic bread and TGIFridays signature Jack Daniel’s Signature Sauce which she immediately wholly claims! If seafood is what you crave, the Chesapeake Bay Seafood Platter is the best bet! It includes a mouth-watering medley of grilled fish, Cajun shrimps (the epitome of perfection!) and golden fried calamari (again RamLal it was done to perfection!) You can also enjoy this platter with an option of Grilled Norwegian Salmon, which I suggest you should definitely have in front of you, no questions asked. By this time, the summit of absolute satisfaction is in sight, and our beautiful goblets are empty, so we decide to hit the bar and see some serious bartending talent. The Texas Platter is the next one in and boasts of the big bold flavours with Bacon wrapped shrimp,(the 2 loves of my life, shrimp and bacon, come together for this absolute beauty), juicy sliced fajita tenderloin steak (this one is flown in from Dubai!, I say, I am loving the chicken, she says!) and yes there is the lip-smacking chicken fried steak with a generous helping of country gravy. We’ve had our fill of the choicest from this spread of kings, and in comes a Triple Berry Shake, which as the name suggest has strawberries, cranberries and blueberries and is a timely nudge towards that summit which by now is within touching distance. All these platters are served with New Orleans Corn Cob and Garlic Bread and you get a lip-smacking side of your choice from Pasta Puttanesca, Caesar Salad or Cajun Onion Rings. We sit there satiated, She and Me, we are basking in the heavenly feel which often accompanies great food, we’ve been flattered and been seduced through it all, but we’ve come out relatively safe. We have a huge crush on this place, but we are still standing. Right then, like Shahrukh Khan opening his arms after which no girl can resist being swept off their feet, arrives the Sizzling Brownie (one of the most authentic brownies I’ve tasted in a long time), which one sweeps us right off. It is then, we realise that as food-lovers, this one goes up on our Major Loving Happening list of all times. Imagine a mix of some good rock music which does not distract, a great ambience, some warm staff, your best friends and your loved ones, some classic cocktails, and this absolutely great fare. It’ll be an evening to cherish I promise! * Disclaimer: The experience was provided by the brand in return for our honest review. Links in the post are for information only.